One more day until the weekend. Just one more day. We can do this...I can do this. It's been another really intense week with my day job and side-work, for a closer look at all the stuff I do besides food blogging check out my personal/art blog HERE, but for now, let's dig into my giant food-stash for a minty, Christmas-y, #tbt review! I picked up this box on clearance right after the Christmas season and it's been sitting in my stash ever since. This flavor variation isn't new, it's been around for quite a while and it pops up every winter, but these just didn't sound that different from the original Junior mints, so I never bothered picking it up. Then they went on clearance for a ridiculously low price, I think it was less then .50 cents or something, and being the mint-loving cheapskate that I am, I figured, "why not?" The box-art for this seasonal item is looking pretty rough. 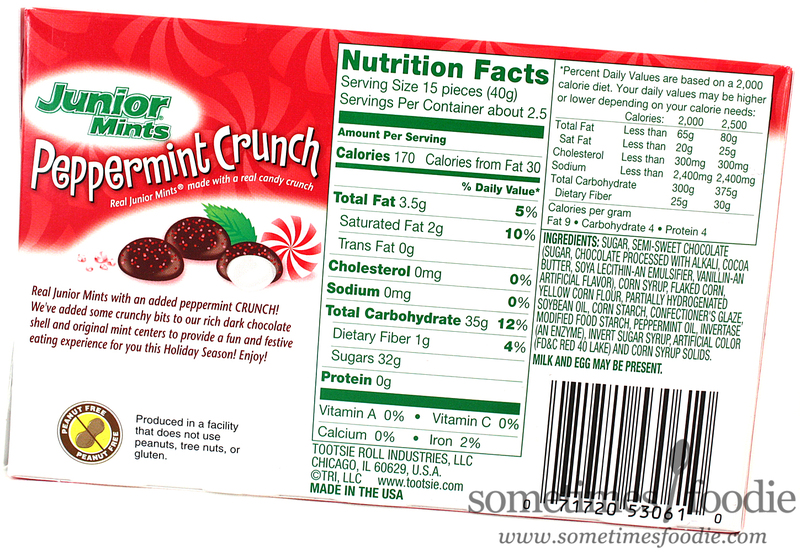 They took the layout from classic Junior Mints, added a red backdrop, a few lazy peppermint swirls, and this really ugly font. It's like Curlz MT and Arial had a drunken one night stand and this typeface was the result. Plus, what is going on with the Junior Mints logo lately? This looks awful! It looks like some low resolution JPEG that was slapped onto the box at the last minute. 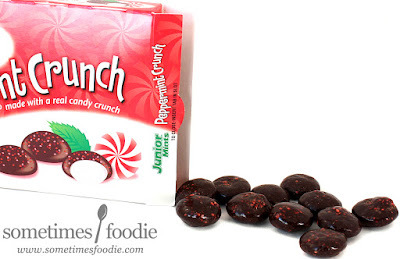 I know they're not the flashiest candy around, but I love Junior Mints. They can do so much better! 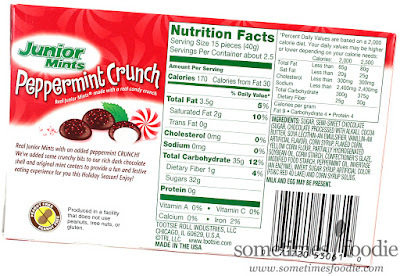 With a name like "Peppermint Crunch" I thought there would be crushed candy cane pieces on top of each candy or something, but these look like red sugar crystals. The kind you use to decorate cookie and cupcakes with. Will they really be strong enough to give me the crunch this product promised? Or are these just a seasonal flop like I always thought they were? 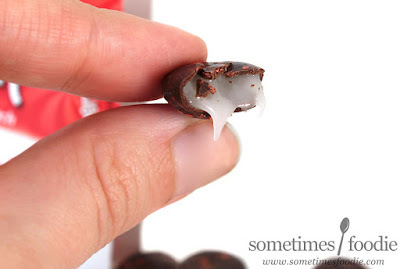 I popped a mint into my mouth and it had the same chocolate-y minty flavoring as the original version I love, but there's a light sugary crunch from the added crystals. 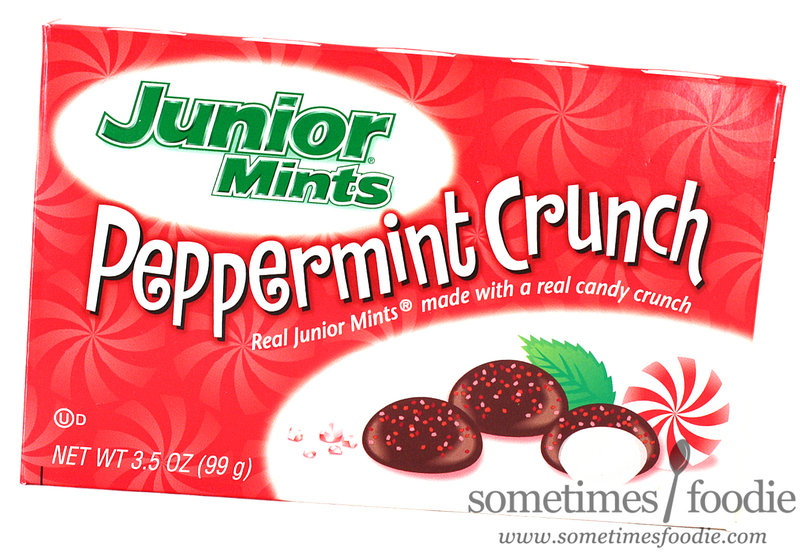 To be honest, the slightly crunchier texture really didn't change anything about the overall Junior Mint experience for me, but I did notice that the peppermint filling felt a lot more solid. These aren't smooth and runny like the original fondant center, these feel more frosting-like...but that could be because these are stale. I mean, these were sitting in my stash for...about 4 months (whoops) and they're loose inside a cardboard box without any kind of plastic bag to keep them fresh. I'm guessing if I had eaten these sooner the texture would have been no different than a fresh box of normal Junior Mints, but I kind of like these being stale. The stiffer filling dissolves more slowly on my tongue allowing me to enjoy the minty flavoring longer. Which is awesome, but that isn't something this candy did on purpose. This was a (pleasant) side effect of my food hoarding tendencies. I picked up some Junior Mints at a convenience store a while back, and it turned out they were REALLY OLD. The fondant center had completely crystallized so they were more like a gritty York peppermint patty and less like a Junior Mint. I know it sounds weird but I LOVED them this way! Sometimes candies are better stale. I am an avid stale Peeps fan, and now I know I love stale Junior Mints too!